I really didn’t know what to make of this comic, which I got on impulse. I mean, it’s DC, one of the major comics publishers, and it’s an ongoing title starring a Black character, which is something you still don’t see a lot of. So, yeah, I decided to check it. Not much info was given for this title beforehand, at least not that I’d seen, but as you can see the cover calls it “the Biggest New Mystery In The DC Universe!” and being part of this new “Wonder Comics” imprint heralded by DC’s newly-hired superstar writer Brian Michael Bendis I hoped for the best. Well, one day Superman and the alien dictator/supervillain Mongul are fighting, and this fight somehow makes its way through Port Oswego, and the two come barreling into town pummeling each other before Superman knocks Mongul into the sky and they continue their fight elsewhere. The entire encounter only lasted a few seconds, but the entire town is flipping out about this, as it’s the biggest event anyone remembers every happening there. Naomi is disappointed because she missed what she believed to be her only chance to actually see Superman in person, although her friends all saw it and can’t stop talking about it. The next day Superman returns to the town to quickly clean up the mess and repair the property damage that he and Mongul caused, and then leaves again. And once again Naomi missed it. Okay so first, here’s the good part: the art. Jamal Campbell is described in the solicitation as a breakout star, I presume he’s relatively new to the business. But he does a good job here, I have no complaints about his art. Unfortunately, I don’t have similar feelings about the writing. While Bendis and David F. Walker are listed as co-writers here, this issue very much reads like the typical decompressed Brian Michael Bendis style of writing that I was never a fan of. This issue is low on action scenes and heavy on dialog. There are a lot, and I mean a lot, of “talking heads” panels here, as well as silent panels which are supposed to indicate dramatic pauses in the dialog. This wouldn’t necessarily be a problem if all of this dialog actually moved the story forward, but it doesn’t. Many crucial details are just left out. We see absolutely nothing of Naomi’s homelife. Her adoptive parents don’t appear in this issue, and we don’t learn anything about them or if they have any other children. We don’t even get Naomi’s last name. So we don’t get any context for the fact that she’s in therapy (we don’t get her therapists name either) although it is implied that it is because of her adopted status that Naomi is doing it. Is her homelife bad in some way, or was everything fine until Naomi found out that she was adopted? How did she find out, when and why? These basic questions would give the reader a reason to care about this. Likewise, there’s no apparent reason shown why Naomi becomes so fascinated the minute she hears a suggestion that there was some kind of superhero incident in the city before and why she’s so sure that everyone who denies it is just hiding something, and that it must have something to do with her. So when the cliffhanger confirms her suspicions I just don’t see why I should care. So as a first issue I must simply declare this a failure. I finished it with no interest in seeing what happens next. So I will not be continuing this series now and cannot recommend. 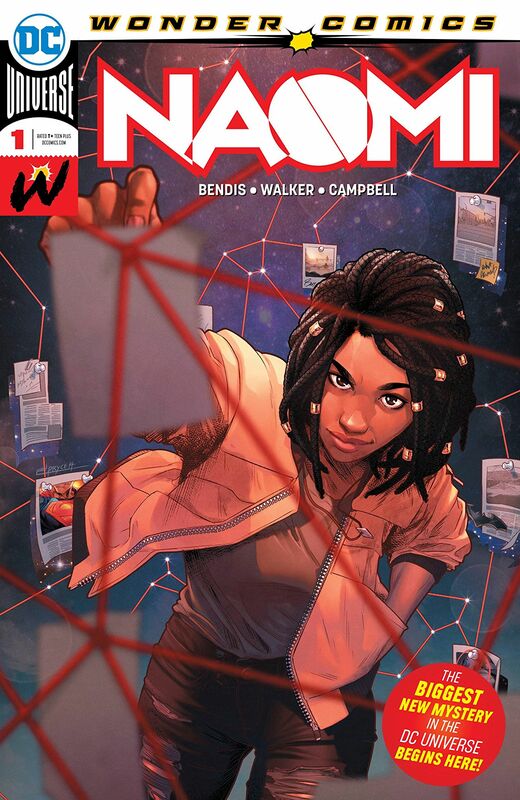 If you want to read a comic about a smart teenage Black girl, check out IRONHEART instead.